Ze daily matériO': Star Wars Light! Attention, Ze Frühstück (nos nouveautés matières, toutes exceptionnelles!) aura lieu le jeudi 21 février, de 9h à 10h, avec café & chouquettes. Inscrivez-vous vite par simple retour d'e-mail. To find a little light under this low sky, come and play with our demonstration kit for diffusing optical fibers, the most efficient in the world! 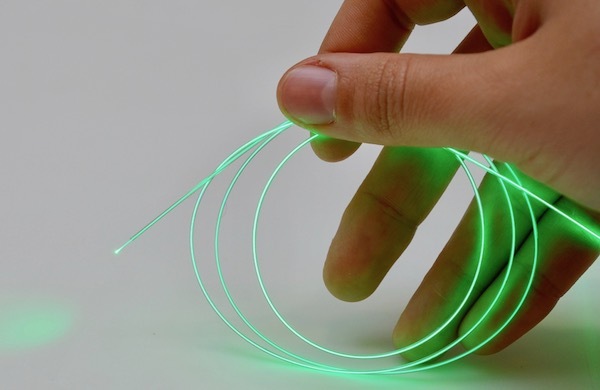 Very thin in diameter (about 0.2mm), amazingly flexible and above all exhibiting a very high lateral light emission ability… better than anything we've ever seen before. At first developped to help algae grow, this fiber is so thin that it is nearly invisible when the light source is off. Suitable for various applications ranging from decoration, fashion, signage, automotive and medical, to name a few. Our next Frühstück (our new materials, all exceptional!) will take place on February 21, from 9am to 10am, with coffee & chouquettes. Register now by simple return e-mail.